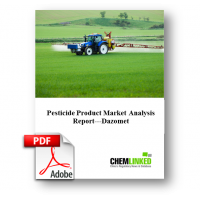 Dazomet is applied before the planting of crops by soil incorporation, thereby causing it to act as a soil fumigant and disinfectant by decomposing to methyl isothiocyanate. It controls soil fungi (i.e. Fusarium, Pythium, Rhizoctonia, Sclerotinia, Verticillium and Colletotrichum coccodes (atramentarium), nematodes, germinating weed seeds and soil-dwelling insects. Dazomet was firstly reported in 1942, and all related patents have been out of date. Currently, BASF is the largest Dazomet manufacturer around the world (product name: Basamid). But Japan is the key market for Dazomety, Agro Kanesho is the main distributor for BASF. Particularly, BASF approved Agro Kanesho to manage their soil fumigants business. In addition, Amvac was approved to be exclusive distributor by Agro Kanesho, while Ceritis USA keeps distribution rights in non-food area.